It might be difficult for me to express how much I love this book. It's such a classic idea--the terrorising, ugly toy that freaks a child out--and how said child will do anything to convince his parents that Koala really should go. But do his parents listen?? From the opening scenes when Koala first arrives, there is a hilarity tension so tight, you could snap it like a rubber band. Santoso's brilliant illustrations show remarkable emotional depth, even with minimal drawings. He instead utilises size and space to create an inherent drama that will no doubt have every reader laughing out loud. 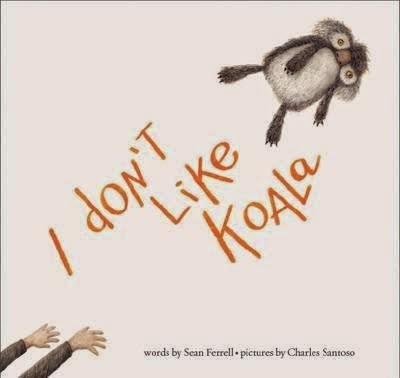 Ferrell's beautifully-timed, succinct text, is picture book genius, and works seamlessly with the illustrations to create a story of hit-and-miss that's almost cinematic. Using both full page illustrations and vignettes, we follow our little hero as he attempts to do away with creepy Koala, only to find the fuzzball has much more than the 9 lives allotted to anything fuzzy. A well-paced and beautifully balanced storyline, this would suit many age groups, and can be enjoyed both aloud and as a reader. The ending is particularly fabulous and I simply adore how it parodies the 'happy ending'.